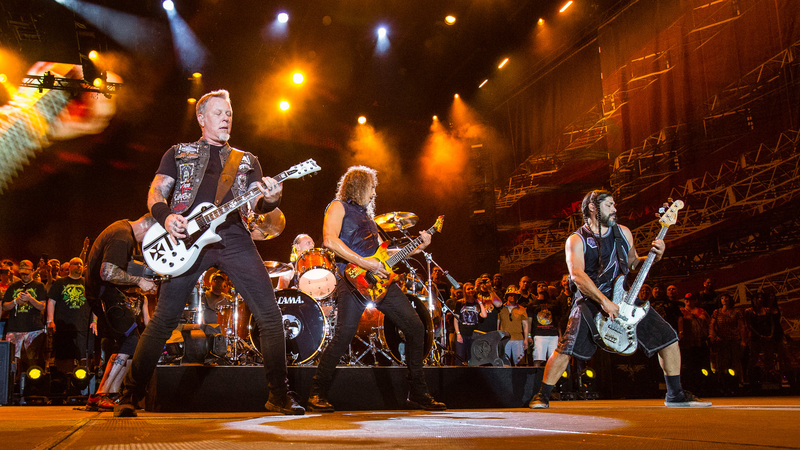 Prior to their May 12, 2017 show at Lincoln Financial Field, Metallica hadn’t toured in nearly half a decade and hadn’t played a note in Philadelphia since 2009. Well, good things come to those who wait, because the Rock and Roll Hall of Famers are set to play their second Philly show in as many years on Thursday October 25 at Wells Fargo Center, as part of their Worldwired Tour. Despite the band’s extended layoff, Metallica has forged a long relationship with the City of Brotherly Love—even playing a free concert in the CoreStates Complex parking lot in the fall of 1997, after playing two shows inside the building the previous spring. Off stage, however, things have been less harmonious at times. The group has endured behind the scenes turmoil (group founders James Hetfield and drummer Lars Ulrich’s squabbles, bassist Jason Newsted’s departure, Some Kind of Monster), tragedy (the death of bassist Cliff Burton), public backlash (Napster) and accusations of “selling out” (1996’s Load, cutting their hair), but there’s something to be said for staying power, and Metallica are true legends of their craft. In an era of decreased record sales and disposable pop music that most people won’t even remember decades from now, Metallica’s last six studio albums have reached number one on the Billboard charts (yes, even 2003’s much-maligned St. Anger) with each recording achieving various degrees of platinum status. That being said, not every band’s catalogue is always flawless, and Metallica is no exception. Many diehards claim the band's latter efforts can't compare with 1991's Black Album—and there may be some validity to that. However, despite the occasional dalliance outside the band’s comfort zone (basically every album released from 1996-99), fans have never strayed from Metallica, and the essence of their thrash metal roots remain intact—due in most part to Hetfield, who at 55 years of age still soldiers on, despite suffering from occasional vocal issues (after almost 40 years of touring, how could he not?) While not one of the founding members, guitarist Kirk Hammett and his signature wah pedals have been a stable presence since joining the group in 1983. Although the late Burton and Newsted have been featured on Metallica’s better-known recordings, Rob Trujillo’s 15-years with the band makes him their longest tenured bass player. Metallica’s first Philadelphia show took place on January 12, 1985, at the Tower Theatre.